When I was writing for Avalon Books, I met Stone Wallace and interviewed him when his Western novel, The Last Outlaw, was released in July of 2011. That interview was reposted here last month. I had ordered a copy of the book to be delivered to a relative’s address in Conneticutt. On the last day I was there and at the last possible moment, as we were walking down the street to a local restaurant, the UPS truck stopped opposite the house and I ran back, certain that UPS had accomplished what the online bookseller had promised. In the case of Black Ransom, Stone had by now signed with an agent and was working on another noir Western. He asked if I would read and comment on the manuscript. On the promise that the superb The Last Outlaw offered, I happily agreed. After several months, the paperback arrived in my mailbox and I jumped in. 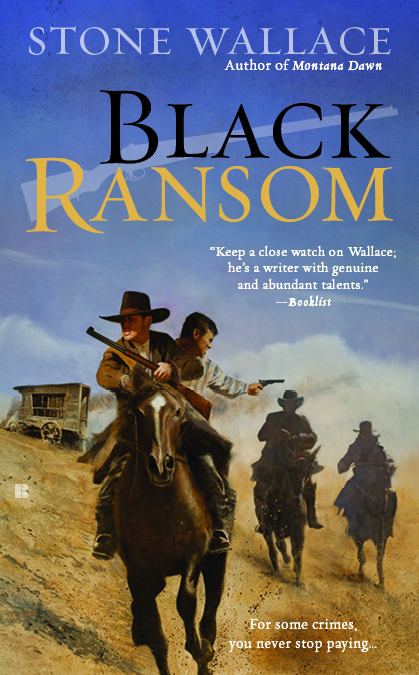 Black Ransom is not the standard Western adventure. Like Cash McCall in The Last Outlaw, the hero, Ehron Lee Burrows, is a complex and eminently sympathetic character, caught up in a desperate situation. He has no control over a recalcitrant judge or the outlaws whose actions involved him in a murder. He loses all that is most precious to him. Vengeful and cruel in-laws, as well as corrupt and callous representatives of the law, conspire to destroy an innocent man. His treatment and seemingly hopeless circumstances contribute to a relentless emotional and physical spiral to an inevitable end. Wallace has created a vivid and compelling portrait of the disintegration of a good man, dismissed by society as a criminal and corrupted by the hatred and malice of his fellow prisoners. The author’s descriptions of prison life in the post-Civil War western territory, his understanding of human strength and frailty and the premise of this tale, make an intense and surprising novel, hard and realistic.